For ages the position of a woman in Indian Society had been marginalized. To reverse this process and to empower the woman ‘Ahilya Sangh‘ was established on 3rd October 2002 under the guidance of Dr. Aniruddha Joshi or Sadguru Aniruddha Bapu. No women should suffer what Ahilya had to from the age of a Ramayana, who was cursed to become immobilized like a stone. Hence the name, Ahilya Sangh!. Ahilya Sangh is not a movement to liberate women, but an effort to help a woman to realize her immense, dormant potential which she could use for the progress of her family, the society she lives in and the nation at large. Although a lot of venues are open today for a woman on educational front, she has moved out of her house for the purpose of education or to earn and supplement her household income.Yet she cannot be said to be truly secure and safe. While travelling in public transport or walking on roads, in offices and even in her own home she often encounters physical and emotional traumas. It has become very necessary for a woman to face any dire situation fearlessly, confidently and on her own merit. For this she has to be competent and strong at different levels viz., physically, mentally and emotionally. The Ahilya Sangha teaches the ancient Indian art of self defence to make women competent and capable at these three levels, to make them self-reliant and if need be help other women in their difficult circumstances. The motto here is ‘Defence is defeat, attack is defence’. 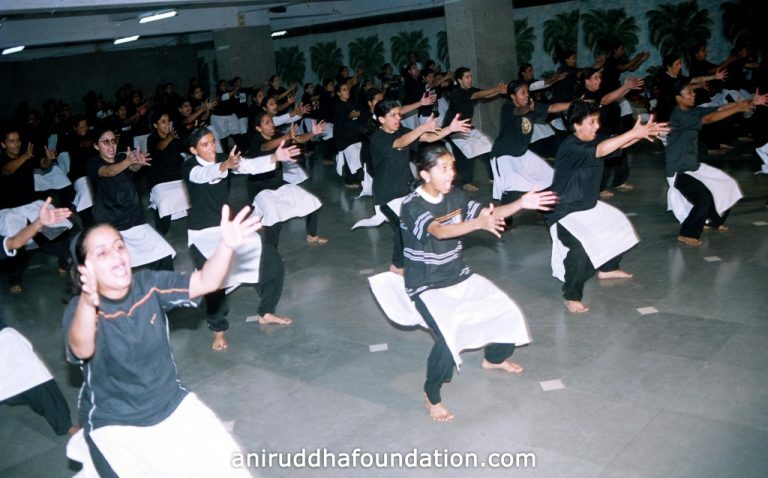 With this concept as its base Ahilya Sangh teaches ‘Surya Namaskars’, different types of exercises, forms of hand and wrist movements – Hastalaghav, Hastakaushalya, Mushtilaghav, Mudgalvidhya, etc. The training given is free of cost. 21 batches featuring 1520 women have completed their training so far. Ahilya Sangh also organises camps to train women in Suryanamaskar. 38 Suryanamaskar camps have been organised in Maharashtra and 2060 women have participated. A woman is naturally endowed with qualities of nurturance. Just as she can nurture a baby, in the same way she can also nourish and nurture a tree. Ahilya Sangha therefore invites women to participate in this activity. So far 1514 trees have been planted through Ahilya Sangh’s efforts.